The Busti Apple Festival is the direct successor to the Busti Pioneer Crafts Festival, the original craft festival of southwestern New York. It is held on the last Sunday in September. It runs 11 am to 5 pm on the grounds of the sponsoring Busti Historical Society, next to the historic Busti Gristmill and museum. There is an admission fee. Parking is free on the adjoining Busti Volunteer Fire Department grounds. Crafts-Sale of hand made handicraft items-private vendors. Farmers’ market-Sales of locally grown produce-private vendors. Ready to eat and take home foods-seasonal and down home. The demonstrations include a wide variety such as spinning and weaving, quilting, flax breaking, candle making, log hewing, and soap making. The craft booths number well over 100. The farmers’ market includes apples, pumpkins, honey, maple products, and vegetables. The foods include over 600 of the famous pies, cider, the authentically made apple butter, beef on kümmelweck, hot dogs, hamburgers, pop, funnel cakes, baked goods and more. Other features include the live one room school demonstration, a Civil War reenactment, music and dance demonstrations, antique and model engines, mill tours, grain milling and much more. Specific demonstrations and other details are subject to annual change. 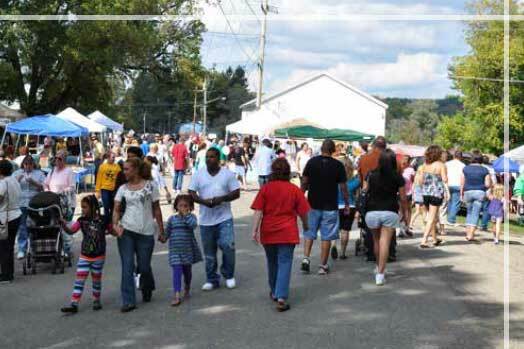 The Busti Apple Festival is held rain or shine and is handicapped accessible. The original Busti Pioneer Crafts Festival was held September 16 and17, 1972, patterned after a festival first held May 22, 1965 in Madison County. The first Busti Apple Festival was held in 1975.